and i have it intalled at when i start it up it doesn't so up. so i used the scrip editor and it work. I haven't tested it in Maya 2015, so I'm not sure it works. I asked someone who has maya 2015 if he can test it, so I'll tell you what he finds when he tests it. But it sounds like you messed up your usersetup.mel, I'm not sure what you did wrong though. Looks like something is wrong with his UV map, because the error is happening when it tries to get the UVs off of a poly. I have no idea how to UV map stuff in Maya, so I'm not really sure how to fix that, sorry. Maybe try redoing them? That is very strange, the error doesn't make any sense. Try going to the MEL tab and putting in python("import CoDMayaTools"); , and then run it with the same arrow button. If you get still get the same error, I hate to say it but you might want to try reinstalling Maya. The error your getting is an indentation error, but the indentation is perfectly fine, which might mean something is wrong with Maya's Python. 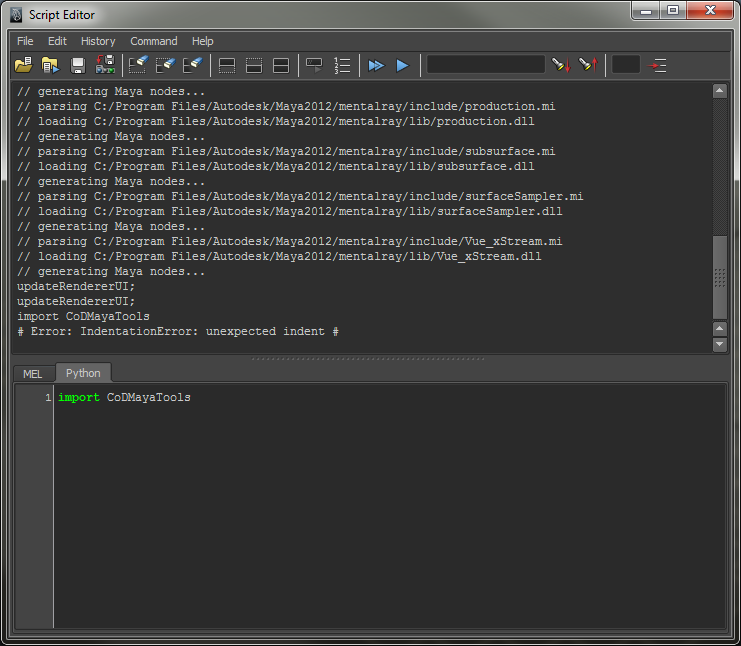 I'm trying to get the CoDMayaTools to work on Maya 2012 x64. Just as the other people have posted before me. 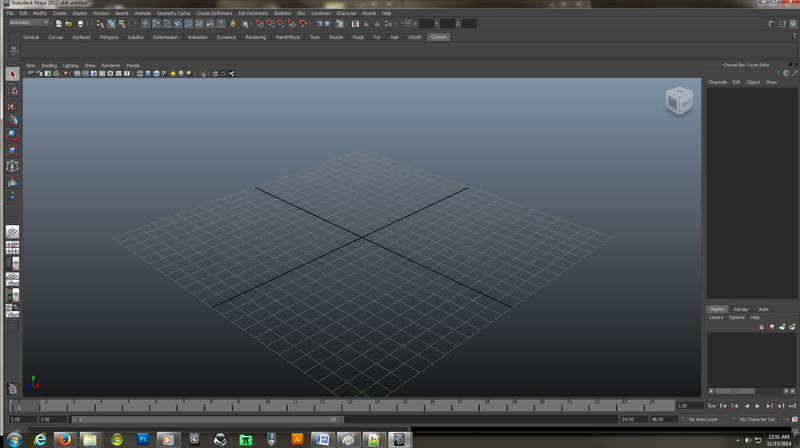 I do what the tutorial says to do but I don't see any button at the top of Maya. Any help would be appreciated. I am new to Maya so maybe do I have to enable it in the window? In the Script Editor window, at the bottom half of the window click the Python tab. In the textbox below, type import CoDMayaTools. Press the blue SINGLE arrow at the top of the window. If it worked, the Call of Duty Tools menu should appear in the main Maya window. If it didn't work, there will probably be an error message in the log on the top half of the Script Editor window. Again, press the single blue arrow button at the top of the Script Editor and if it worked, the Call of Duty tools menu should appear. Is that only for Maya 2015, or for all versions? The normals are determined by the order of the vertices, so I might be loading them backwards, or Maya 2015 might have a different vertex order. Script seems to work, but source looks terrible. You have to read about structs at least. It's just a pain to see avoiding OOP in languange that mostly rely on it. It only works on CoD5 guns, sorry. Updated to version 1.5.1, which adds CoD4 model importing, and some bug fixes. Due to a bug in version 1.5, this update cannot be downloaded through the auto-updater, and you will have to download it manually (just replace the existing script with the new one). 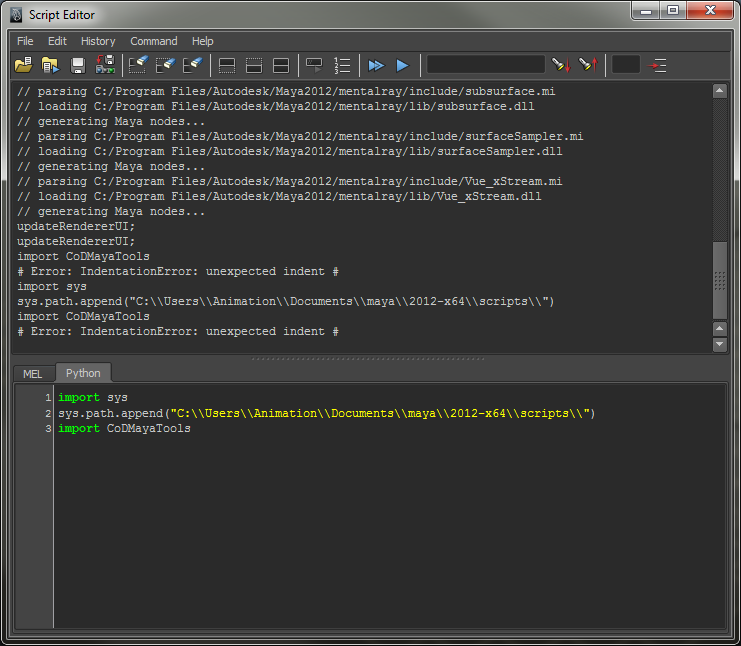 Tried doing it but since your tool reads default folder and actually adds 'xmodel'/'xanim' to the folder path it breaks. 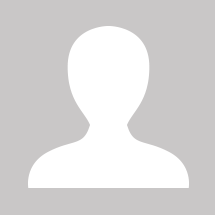 For exporting, it exports the .xmodel_export or .xanim_export the wherever the save path is. For importing, it uses the path "<given root folder>/raw/(xmodel, xmodelsurfs, xmodelparts, images, materials)". A single model uses info from 5 different folders, so having it base the path on the current root folder is easiest. If the root folder given doesn't have those folders, it won't be able to import a model. Any CoD root folder has those folders, but right now the tool will only work for CoD5 models, so you shouldn't be using it for any other CoD games anyways. Well right now it only supports CoD5, but I'm working on adding support for other CoD games. If you want it to use another root folder, you can use the "Set Root Folder" button in the menu. Just updated to Version 1.5, with some cool new features The tools can now import CoD5 models, including the skeleton rig and can add IK Handles on character models. I also added an IWI to DDS converter, and the script will auto update now. For future versions, I'm planning to add in XAnim importing, and then add in support to import models/anims from CoD4 and from FastFiles. I haven't Exported anims yet but the models works fine! I think you can change the material name by selecting an object using that material, and then in the Attribute Editor go to the material tab and changing the name in the text box. The ":" probably means you have two separate materials with the same name, I would guess (":" and "|" are Maya's DAG path separators), so make sure each material has a unique name. I'm not very good with Maya, sorry. does it work for 2015? I've only tested up to 2014, but it probably works. The "CoDExportTools.py" script you downloaded should go in the same folder as the usersetup.mel, but you don't need to change anything in it. Once you do all that, restart Maya and if you did it correctly you should see a "Call of Duty 5 Tools" menu at the top of the main window. Download the update from the download button on the first post. Just replace your old script file with the new one. Okay, I think I fixed the excessive TRI_VERT_RATIO errors with this exporter. Of course, the error will still happen if something is wrong with your model, but it should happen less often now. Download the 1.3 update to get the fix. I made this Asset to GDT converter a while ago for someone, and they suggested I post it. I posted it. It converts most simple asset types, like weapon files, into GDTs and allows you to create a new GDT to put them in or merge them into an existing GDT. I made this really fast, so use with caution because things I make tend to have problems (backup GDTs before merging and stuff).